This summer the Australian Museum will be brought to life at night with Culture Up Late, a season of virtual reality shows, hands-on workshops, live music, special tours, performances and protest. Each Wednesday night, the nation’s first museum will celebrate First Nations, Mardi Gras, science, art, the environment and love, offering a mid-week diversion with a difference. “We Stand Strong”: curated by the musuem’s First Nations staff in celebration of Indigenous protest and resilience, with deadly-designed jewellery workshops, a live DJ playing “decolonisation beats” and Change the Date VR rap video. “Anti-Valentine’s Day”: an unconventional and uncommercial take on affairs of the heart, with live performances of love songs gone right and wrong, “speed hating” sessions, Voodoo doll workshops, couples’ game shows and the live dissection of a pig’s heart. “Turning the Tide”: join scientists, activists and artists in exploring threats to the world’s oceans and marine life, and discover how to be part of the solution, through short films, live music and an immersive VR experience of coral bleaching in the Great Barrier Reef. “Another View”: presented as part of the Sydney Gay and Lesbian Mardi Gras, explore the AM with a queer eye through LGBTQI cabaret performances, live art and an irreverent “Mating in the Wild” tour of the animal exhibitions. 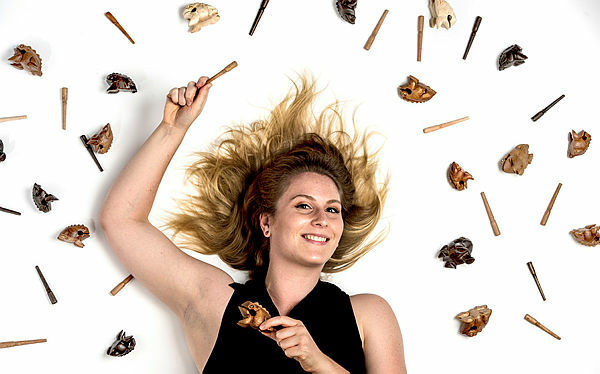 A highlight will be a performance by Conservatorium of Music Masters student and sound artist Alexis Weaver (pictured), who has created a new work inspired by the Australian Museum’s FrogID citizen science project, featuring recordings of frog calls submitted by the public via the FrogID app. Her interactive “Frog Chorus” is part of Conservatorium Compositions for Culture Up Late at the Australian Museum, across January and February, 2018, and includes a live performance by audience members playing small wood frogs. Australian Museum Director & CEO Kim McKay said Culture Up Late offered visitors a different look inside the nation’s oldest museum. Visitors will also enjoy exclusive after-hours access to the museum’s collections and exhibitions, including Mammoths – Giants of the Ice Age, which features 42,000-year-old baby woolly mammoth Lyuba, the most complete prehistoric animal on the planet. Program Manager Mathieu Ravier said there was “something magical” about exploring the museum after-hours. Cost : Adult $20, Conc $18, AM Members $16. Inspiring women curate and perform Half the Sky’s diverse and surprising offerings. Savour bespoke tours and tall tales from the museum’s collections, scientist talks, workshops, live music and an intimate one-on-one performance that is driven by adventure, touch and trust. An evening exploring affairs of the heart in their many exquisite forms, dedicated to those unimpressed by crass commercialism, glib sentiment or cliché. An unconventional and uncommercial take on love and life, with performances of love songs gone right and wrong, “speed hating” sessions, Voodoo doll workshops and live dissections. The threat to the Earth’s marine life and oceans posed by pollution and climate change demands action. Join scientists, activists and artists to better understand the problem and discover how to be part of the solution, through short films, live music and an immersive VR experience of coral bleaching in the Great Barrier Reef. During this special evening, presented as part of the Sydney Gay and Lesbian Mardi Gras, LGBTQI artists explore new museum perspectives through performance, tours and live shows. The evening features live cabaret performances, art and an irreverent “Mating in the Wild” tour. Join us as we bring the museum’s Pacific collections to life through storytelling, creative arts, performance and the sharing of knowledge. The evening features cultural dances, Pacific DJ tracks and a special tour of the museum’s collections and galleries. Aboriginal guests examine how First Nations knowledge may be the key to a better shared future for us all. After 60,000 years of sustainability, what next? The evening features bite-sized language lessons and workshops in bush food and making jewellery with natural materials.